It’s Tuesday morning and I’m writing in between coats of nail polish. It was way past time to give myself another pedicure (I’m too cheap to pay for one). I’ve not been super good at getting things done lately – I’m blaming the recent weather (notice how I always have an excuse – that takes real practice, you know). It has rained for like, a year (or a week) and gray skies are my kryptonite. Today might be better, as I saw some sun really trying to peek through the clouds this morning but since it hasn’t tried hard enough yet, this day may be another ugly display of uselessness. I’d better hurry and write this before I fall out of my chair. I know I said in my last entry that I’d be doing a post on some designing I’ve been messing with, but that’s not gonna happen today (see above paragraph), so if you’re looking for more than randomness here, you may want to stop reading now. Please don’t really. I’d be sad. First, I want to put in a shameless plug for my daughter’s blog. My daughter is something of an extreme bargain hunter. She once scored a pair of stylish boots for 4 (four) cents. That’s not a typo – you can find a post about it on her blog here. Her blog is called “Anything You Can Buy, I Can Buy Cheaper.” I’m so proud of her, she’s only been blogging a little over a month now but she managed to get herself mentioned in a recent post on the Independent Fashion Blogger’s web site for a post she did on store credit cards. So visit her blog and poke around some, would you? Sarah Ronchetti’s BasketWeave Rib socks are such a great knit (and yo...it's a FREE download - thanks Sarah!!). The pattern is interesting enough so I’m not bored but not so hard that I have to sit in a sensory deprived room in order to complete them properly plus I’m using Malabrigo Sock so life is good. I was going to try the magic loop method to do the second sock to see if I liked it better than my dpns (can you believe I actually managed to begin liking dpns??) but to be honest, I couldn’t get my join in the round to work. I am pretty sure a quarter of an inch space in the join isn’t going to look very good. Since I’m such a patient person, I naturally tossed my long circular aside after two attempts at the join and picked my dpns back up. Maybe I’ll try the magic loop method again sometime. Or maybe I’m just saying that so you won’t realize I’m actually a real curmudgeon that gets set in my ways much too easily. Third, I also started my first project using some colorwork! I'm making Eunny Jang's Endpaper Mitts with some DROPS Alpaca I got on sale at my LYS a while ago. I can be excited about this because so far, I'm doing really well. Yes, those first two rows are looking good. 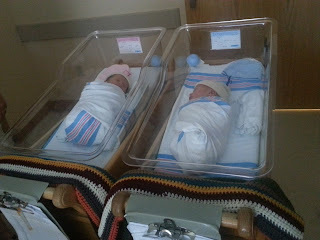 Fourth, the twins are here! Actually, they were born on June 24th but since I’m a slug lately, I’m just now managing to tell you. No, I didn't do those blankets. They appear to be crocheted. Marley and Tripp are adorable and will require many more hand-knits down the road. I figure at the rate these little ones grow, I’d better start on something now for their first day of kindergarten. Well, I’m sure that’s just about all the “edge-of-your-seat” excitement you can handle for one post and I know it is certainly all that I can handle, so I’ll be off. I need to apply my top coat. Your sock looks great! I think it is good you didn't end up doing the second on using Magic Loop. Your tension might have come out a bit different, and if that happened you would end up with two different sized socks. I'm headed to check out your daughter's blog as soon as I leave this page. I LOVE saving money! Though, I've never gotten a deal as good as 4cent boots. That is one good looking sock. I'm knitting Sarah's Scout Base socks at the moment, and I may try this pattern next. Ooooh, the Scout Base socks are nice! They're now in my library on Ravelry! Your sock looks wonderful!! and awww to the gorgeous twins! Thanks, Sarah! I actually finished my socks tonight and I love them! Can't wait to show them off!